Oregon's offense as a Speed Advantage, should data center support be faster? College football is more fun to watch given the creativity coaches try for a competitive advantage. This got me thinking after talking to a data center executive and how some of the most difficult changes can be caused by people who want to keep things the same as the status quo protects their jobs. WSJ has an article analyzing the speed of the Oregon Duck offense. Top-Ranked Ducks Hustle Between Plays to Tire Opponents; the Next Great Innovation? 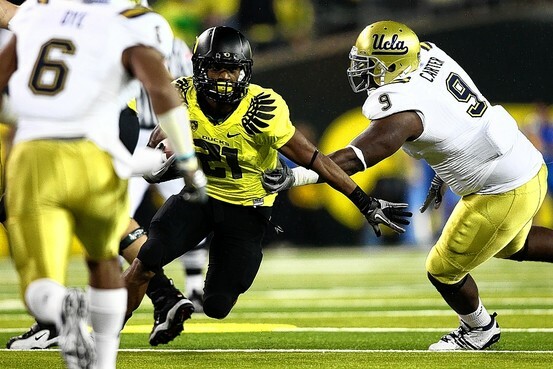 LaMichael James (center) of Oregon runs the ball against UCLA last week in a game that the Ducks won 60-13. Like any endeavor, college football has a number of traditions and standard practices that don't make perfect sense. Take, for instance, the pace at which most teams run their offenses. On average, it takes about 34 seconds from the end of the previous play for a conventional college team to start the next one—an interlude in which players walk to the line of scrimmage, catch their breath and convene a short staff meeting known as the huddle. Here is a video clip that shows the speed of Oregon offense. Watch the play clock in the background. The speed of football is something that seems like a constant. But, what happens if you challenge the status quo and prioritize speed and agility. The ability to keep the defense off balance. Based on a sampling of recent games, Oregon's average time between plays is 23.2 seconds—32% faster than the norm. And for them, that's just third gear. In their most recent game at home against UCLA on Oct. 21, the undefeated Ducks were doing 23 seconds between plays during their first possession until they reached the Bruins' eight-yard line. Then they ripped one off in 14 seconds, while UCLA's players were still getting set. The result: an eight-yard touchdown run that met almost no substantial resistance. The Oregon coach even distracts from his strategy. Oregon coach Chip Kelly was coy this week when asked about the thinking behind his team's frenetic pace. "It's just for television," he said. But as the 7-0 Ducks roll through their schedule, exhausting the opposition with their running game and their tempo, it's becoming apparent that Oregon's fast-paced style of play is potentially the next great evolution in the sport. Many will say you can't do this in data centers. But, think about this. And for the man in charge, Oregon's style has further benefits. "As a playcaller, you can call a lot of really bad plays and people will forget about them," Mr. Kelly said, "because we're on to the next one." Think about who are the most innovative and whether they are willing to make more decisions, understanding the risk. Look how many data centers have problems and they move slowly with a consensus to minimize risk. Being the slowest is not necessarily the best, but it can be the safest to protect the jobs of the team. How many companies are thinking like this? "We're playing at a pretty good clip now because our players have a pretty good idea what we're trying to do," said Mr. Kelly, the Oregon coach. "We just try to eliminate that time between plays. Just go play." Can you imagine a data center support team who moved as quickly as the Oregon Duck Offense?